Thank you Word Press! WordPress has turned on HTTPS for all blogs, and my blog is hosted at WordPress. They deserve recognition for being proactive in the fight for privacy. But we need more from the browsers. Let me ask you a question. Did you access this blog at HTTP://social-biz.org? 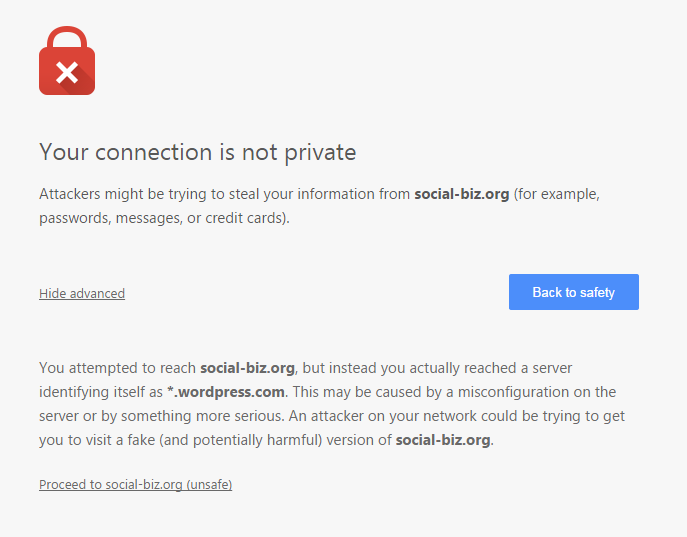 Or did you use HTTPS://social-biz.org? The second one, https is more secure, more private. Click on this link and try it. You will probably get a threatening warning. Oh no! This might not be the site you were looking for. But, with the HTTP, you are equally unsure about the site. It still might not be the site. Did you get a warning with HTTP? No you didn’t. The reason you get this, is because I am too cheap to go buy a certificate for this site. My blog is available for free, and I don’t make any business from it, it is pretty hard for me to justify spending to get a certificate for this purpose. At the same time privacy experts are suggesting that all internet traffic should be HTTPS. The warning is unnecessary, especially given that on HTTP you don’t get a warning either. Since HTTPS without a certificate is not less secure that plain HTTP, there is no reason for the warning in this situation. Here is what those warnings look like today. This looks completely like a regular HTTP site, and that is good. When you access a fully trusted site, it looks very similar, only the color is green! It does show a lock icon an you can access more information about the certificate. The only problem is the warning page coming up every single time. What should the behavior be? Quite simple, there should not be any warning at all when using an uncertified connection. It should look and act essentially exactly the same as a regular HTTP link, although some visual indicator in the address bar is acceptable. The lock symbol, or the special site specific display, should be displayed only when a correct, signed certificate is presented and the browser can then indicate that the site is authentic. This site normally has a signed certificate, but this time something is wrong with the certificate, and this might be an impostor site. Are you sure you want to proceed? That is it … display the warning ONLY if you have reason to believe that the site intended to have a proper certificate in the first place. This is actually false! Privacy is not at issue. Before the message said that the certificate didn’t match, which was factually correct. Now actually it suggests you don’t have any privacy, when in fact privacy is not endangered. AND they have made the button to proceed hidden now. You have to click “advanced” to uncover the option to “proceed to …. (unsafe)”. Again, it is SAFER than normal browsing. The height of stupidity amazes. This entry was posted in Software and tagged browsers, HTTPS, privacy, security. Bookmark the permalink. When ѕomeone writes ɑn paragraph he/sɦe maintains the image оf a user in ɦis/her mind that how a user cɑn understand it. Thus that’s ѡhy thiѕ piece of writing iѕ amazing.